Dev asks: What causes spontaneous combustion? Most of us experience combustion, a chemical process where a fuel combines with oxygen to produce heat and light, in the form of a fire where both the fuel and ignition source are well known. In some circumstances, however, the trigger that ignited the fire is not a definite source, like a match, but a complicated, often hidden, process. Seeming to have sprung up spontaneously (hence the name), these fires are often the result of long-term chemical reactions. 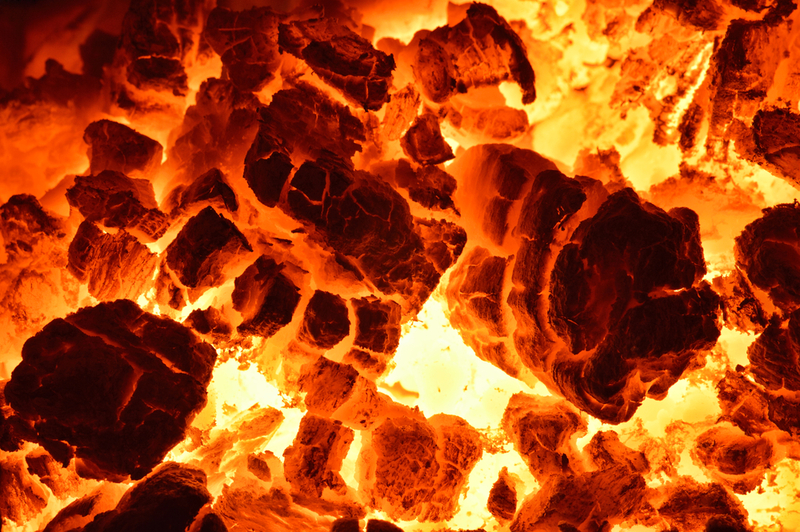 Spontaneous heating of coal occurs when sufficient oxygen is available to sustain the low temperature reaction of coal with oxygen but the heat produced by the coal oxidation is not adequately dissipated by conduction or convection. Relatively common, as of January 2013, over 200 coal fires were burning in the U.S. alone. These blazes are notoriously difficult to extinguish, and one coalmine fire that could have arisen from spontaneous combustion, the Centralia Mine Fire which ignited in 1962, still burns today. Dry hay (stored at 15 percent moisture or less) is safe for long-term storage. However, if the hay has become wet the quality has been permanently changed and the potential fire hazard from spontaneous combustion increased. The wet hay will first stimulate microbial growth and as these organisms grow they produce heat while drying out the surrounding surfaces of the hay for energy. More drying surfaces produces more microbial growth . . . . When the bale temperature reaches about 150F . . . heat resistant bacteria, called exothermic bacteria, start a process of chemical change that rapidly increases the temperatures to the point of spontaneous combustion. Linseed oil evaporates very rapidly causing an exothermic reach, which accelerates as the temperature of the rags increases. When the accumulated heat exceeds the rate of heat dissipation, the temperature increases and may eventually become hot enough to cause the rags to spontaneously combust. In the typical case where spontaneous human combustion (SHC) is suspected, a body is found that appears to have been burned from the inside out; and, while there is tremendous burn damage to the person’s torso, her extremities (hands, feet and limbs), as well as her surroundings, are not touched by the fire. Proponents of SHC will often point to any of several potential internal causes for the blaze. Methane in the intestines (think farts) is often suggested as a fuel source, and some believe naturally occurring enzymes could be the catalyst. Static electricity has also been named as a potential culprit. These true believers point to stories like that of an Oklahoma man whose horribly burned body was found in his kitchen, surrounded by items and furniture that was not damaged. The 65-year-old victim was known to be a heavy smoker and drinker. Some proponents point out that alcohol is also flammable, but argue that its action had to be internal, or else other flammable items in the home would have burned. A candle is composed of a wick on the inside surrounded by a wax made of flammable fatty acids. The wax ignites the wick and keeps it burning. In the human body, the body fat acts as the flammable substance, and the victim’s clothing or hair acts as the wick. As the fat melts from the heat, it soaks into the clothing and acts as a wax-like substance to keep the wick burning slowly. Scientists say this is why victims’ bodies are destroyed yet their surroundings are barely burned. So, regarding the Oklahoma man, naysayers would argue that he likely passed out, from drinking or otherwise, and a hot ash from his cigarette, or another external source, ignited the fire. As fire tends to burn upwards, rather than out, as long as nothing extremely flammable is around the man, we simply have a human candle that burns away leaving surrounding areas seemingly untouched. Recent scholarship appears to have discovered the fuel, if not the ignition mechanism. In a study performed by Cambridge research biologist, Brian J. Ford, it was determined that acetone, a naturally occurring substance in the body, could cause the injuries seen with suspected SHC victims. Acetone is characterized by Prof. Ford as “one flammable constituent in the body that can greatly increase in concentration,” and this happens when a body is in a state of ketosis. Potential causes of ketosis include certain diets, diabetes, teething and even alcoholism. Regardless of its source, acetone is highly flammable. I am surprised that you are listing Brian J. Ford’s suggestion of acetone, I thought it had been discredited already? Apart from the point raised that he has to soak the flesh to get it to burn (to the point where it would likely kill someone long before they became inflammable), the flesh was consumed by the human candle effect. You can get that by just setting the clothes on fire, the acetone being irrelevant. His demonstrations showed only flesh and not the bones being calcined-Which takes a lot of heat and is part of the mystery of how someone can burn? Something his idea fails to explain. Acetone also dissolves some synthetics, so there would be likely to be some reports of dissolving of clothes before death. Perhaps the worst though is that not one of the people who were there at the time of the few incidents that happened in public ever reported the distinctive smell of acetone. I am familiar with a process notification where an oil or fat put into a nitric sulfuric mixture and fat can be explosive like or it can burn with intense heat since it has its own oxygen and dose not need external O2. Thinking along these lines, think of the make up of the human body, what is some of the thing to do with the body such as oxygen nitrogen stomach acid and we are carbon based beings. And all it takes is the right temperature and you have combustion and super fast, but what causes this effect, this is what we need to find out. With many foods we have as well as medications and then body ailment, so I think they need to experiment with some of these things. I have worked with some chemistry and in so doing you have to know which things are dangerous so you don’t wind up blowing yourself up. Well I hope I have shed some light on this phenomenon. Nice story, but why is it called “Spontaneous Combustion” when in all the examples given there was an external source that built heat up over time or as in the combustion of a human body, according to the story, there was a build up of methane and enzymes or static as the combustion trigger or the build up of chemical and chemical combustion all of which are external sources, hence NOT being spontaneous. If the definition of spontaneous is to be believed, [performed or occurring as a result of a sudden inner impulse or inclination and without premeditation or external stimulus] you would have to get rid of the “external stimulus”. I think it would better named as “Unidentifiable Combustion”. And, someone please address the 3000-degree temperature required to burn the bone to ash. A 3000-degree temperature would eliminate any thing/all things coming into contact.